The Independent National Electoral Commission (INEC) has fixed November 2 for the conduct of governorship elections in Kogi and Bayelsa states. The commission disclosed this in a statement by Mr Festus Okoye, INEC National Commissioner and Chairman, Information and Voter Education Committee, on Tuesday in Abuja. Okoye said that the Commission, at its meeting held on Tuesday, approved the Timetable and Schedule of Activities for the governorship elections in the two states. He said that the official notice for both elections would be issued on August 1, while political parties that intend to sponsor candidates were to hold their primaries for the nomination of such candidates from August 2 to 29. “Campaigns by Political Parties in public shall commence on August 2 and end on October 31. 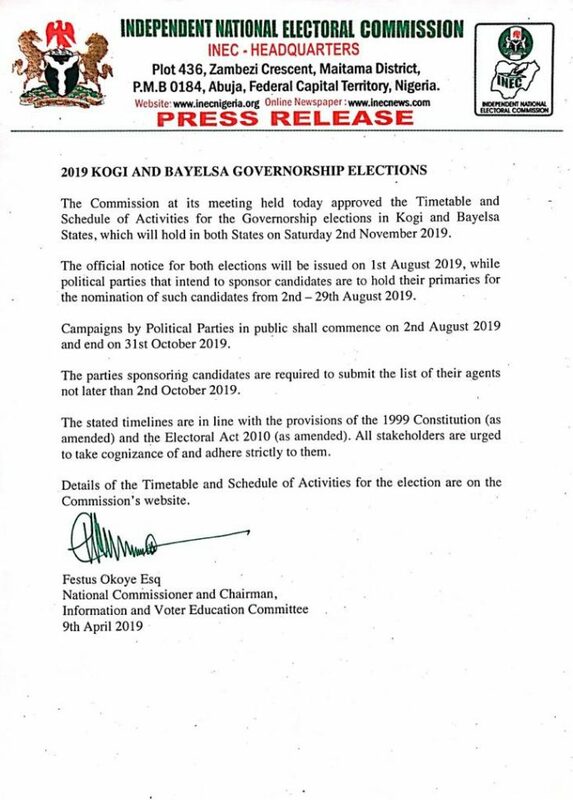 He added that the details of the timetable and schedule of activities for the election were available on the Commission‘s website.